BLAZING with brilliant, ever-changing colors that rival the hues of the rainbow, the illuminated face of a giant electric clock is attracting crowds to an exhibit of timepieces at the San Francisco World’s Fair. Visitors, curious to know how this spectacular effect is obtained, are amazed to learn that this gleaming disk of light, sparkling with an intricate, moving pattern of colorful stars and concentric circles, is produced not by any complicated arrangement of colored bulbs, projectors, and revolving niters, but merely by plain white light, and strips of transparent cellulose mending tape sandwiched between two practically colorless disks. What, they ask, is the magic element that transforms these simple materials into a myriad of whirling rainbows? Polaroid, the crystalline substance invented by Edwin H. Land, Boston scientist, that produces and controls polarized light (P.S.M., Apr. 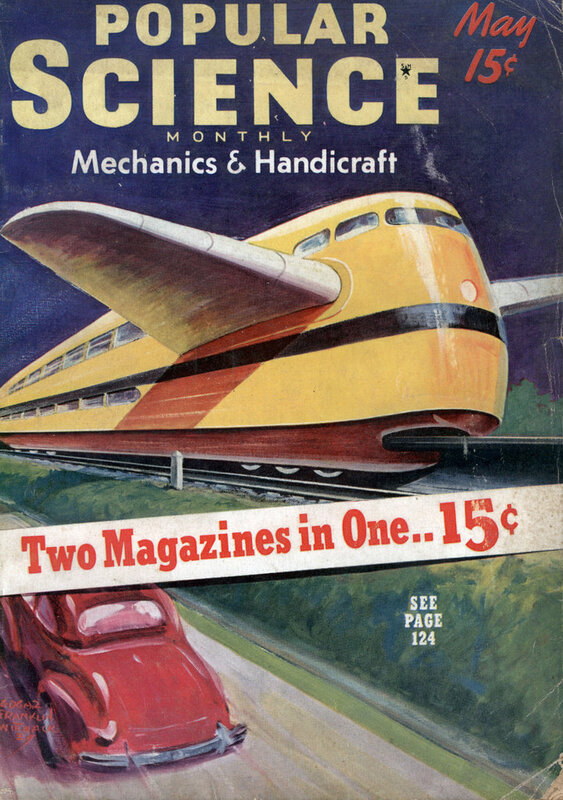 ’36, p. 20), provides the key to the mystery. First placed on the market only a few years ago, this polarizing material is already well known through its extensive use in sun glasses, camera-lens filters, desk lamps, train windows, and microscopes. In industry, it is used to spot invisible strains in glass and other transparent materials, much as X-ray apparatus is employed to track down hidden defects in metal parts. But few people today know that polarizing disks can be made to create vivid colors such as those that shimmer on the face of this mammoth clock. 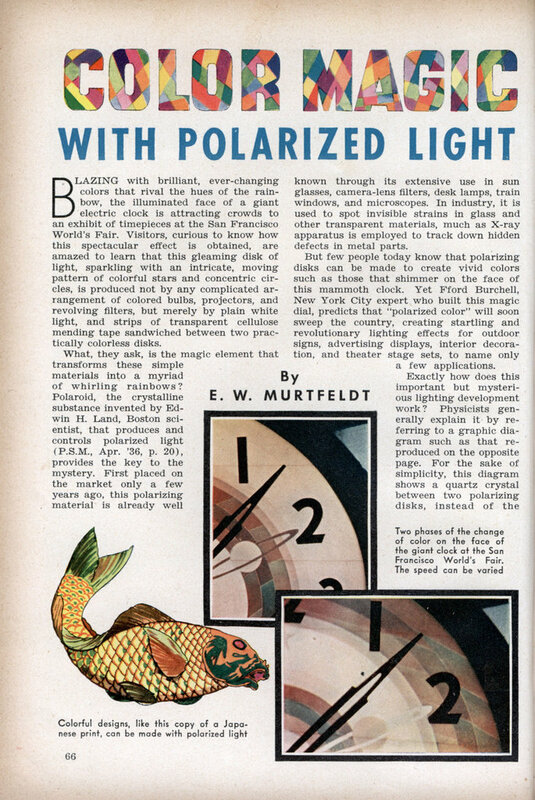 Yet Fford Burchell, New York City expert who built this magic dial, predicts that “polarized color” will soon sweep the country, creating startling and revolutionary lighting effects for outdoor signs, advertising displays, interior decoration, and theater stage sets, to name only a few applications. Exactly how does this important but mysterious lighting development work ? Physicists generally explain it by referring to a graphic diagram such as that reproduced on the opposite page. For the sake of simplicity, this diagram shows a quartz crystal between two polarizing disks, instead of the mending tape used in the clock dial, for the tape acts on polarized light in a more complicated way, although the general principle is the same. With the diagram as a visual guide, follow a beam of light on its path through the first disk, into the crystal, and out through the second disk. Vibrating in all directions, the beam strikes the first polarizing disk, which acts like an opaque circle with countless optical slots cut in it, letting through only light vibrating in a single plane. Next, the beam enters the quartz crystal, where the different colors that make up this polarized white light are “twisted” by various amounts, each color emerging at a separate angle, something like a wheel with spokes painted in various colors. Only the particular color emerging at the same angle as that of the optical slots in the second polarizing disk will pass through and become visible on the other side. If you rotate the disk, the colors change as the optical slots coincide first with the angle of one color and then with that of another. This, in simplified form, is the general principle employed to change the plain face of this huge clock into a brilliant galaxy of colors. The clock itself is built like a mammoth five-layer cake set up on edge, with each layer measuring about six feet in diameter. The bottom, or back, layer serves as a circular light box, with twenty standard light bulbs arranged around its inside rim. In front of this light chamber is a diffusing screen that spreads the illumination evenly over every part of the dial. The third layer, more like an icing, is a thin polarizing film. This is the disk responsible for the changing colors of the clock face, since it is slowly revolved by an electric motor with a rheostat control to regulate its speed. Layer No. 4 is a disk of transparent acetate material on which is mounted a pattern built up of about 1,000 strips of the cellulose tape. These are laid down in from one to six thicknesses, and set so that the grain of the material lies at varying angles. Finally, the second polarizing disk, fixed in a stationary position, forms the top layer of the “cake,” which is garnished with black hour numerals, and with the two moving hands. The most delicate part of this polarized color process lies in mounting the cellulose tape in designs that will produce a balanced array of colors. A pattern is first drawn on paper to serve as a guide. Then a sheet of clear acetate material is placed over it. On this, cellulose tape is cut and pasted down over each section of the design, following a chart that tells what colors will be obtained with any number of tapes at given angles. The skill with which this work is done is evidenced not only by the spectacular clock dial, but also by an amazing group of moving color displays in a demonstration room at the Burchell laboratory in New York. These include a star design that whirls through a dazzling spectrum of color, a flower pattern with petals that shift slowly from red through green and blue to a deep purple, and a fish, copied in amazing detail from an old Japanese print, with iridescent scales that shimmer in a thousand delicate hues.